Marimorena – Is it sexist to use this word in Spanish? The origin of the expression ‘marimorena‘ is not well known. What is certain is that it arose in the mists of the late 1500s during the emergence of imperial Spain. A story places Mari Morena, a woman, at the centre of this meaningful expression, associated with scandal, trouble, fights and quarrels. I will refer to the colorful version of the story given in the 1899 publication España Moderna, Modern Spain. It intrigues me as to why the name of a woman should become so associated with those actions that are generally more attributed to men. The Royal Spanish Academy Dictionary clearly states that marimorena is a colloquial feminine noun, meaning: to fight, quarrel and brawl . The version of the story appearing in the 1899 publication España Moderna, Modern Spain  unveils significant details as to how the name of Mari Morena has transcended the centuries. By 1579 there was a well established taberna, tavern, in Cava Baja, a street in Madrid run by Alonso de Zayas and Mari Morena, his wife. 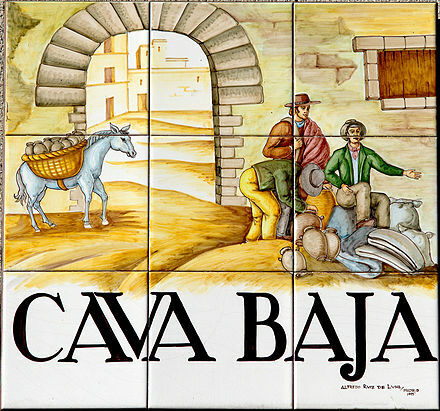 The Cava Baja is one of the oldest streets of Madrid and by the 1600s would have been the hub for arrivals and departures, for carriers of merchandise and couriers bringing the mail to the provinces. Later, it became synonymous as the place where groups of thugs used to frequent. 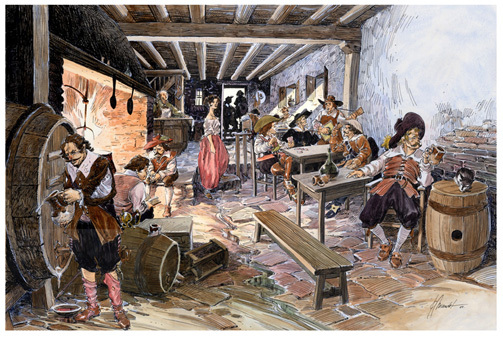 In 1579, Alonso de Zayas and Mari Morena became very well known in Madrid following a high profile judicial court case which took place as a result of a quarrel that arose in their tavern. Alonso de Zayas and Mari Morena had refused to serve their finest wine, contained in cueros de vino, leather wine holders, to thirsty soldiers, because it was reserved solely for members of the Court and their more illustrious customers. According to the chronicles of the time Mari Morena stood her ground during quarrels in her tavern better than anybody else. She was known as a barmaid ready to ‘crack heads’ to resolve any quarrels by those who did not want to pay or were drunk; and her name and manner survive to these days. Then as an extension of her name the expression se armó la marimorena meaning “it was a serious quarrel or fight”, entered the language. Although this story tells us about a remarkable woman who knew how to fight her corner; it appears that the meaning of this expression has evolved. I agree with those who argue that this expression may perpetuate the stereotypical view of women as being quarrelsome. Perhaps, the challenge which faces us today is to restore the original meaning of marimorena as an expression to describe a woman who stands up for herself. For the Real Academia Española, Spanish Royal Academy’s definition of marimorena, please click here. 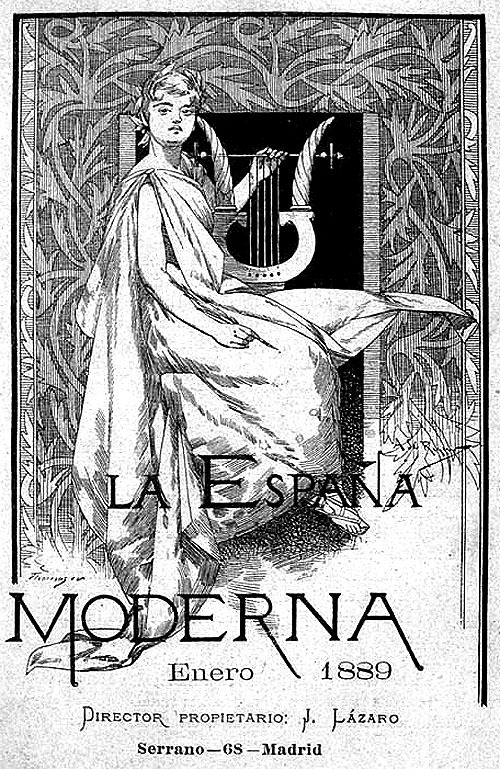 España Moderna, Modern Spain, año II, número 128, page 115, agosto de 1899, Madrid. To access the pdf file of this publication, please click here. I’m definitely a marimorena in the older sense of the word! Dear Jeni, I believe that the world needs as many marimorenas as we can find! Thank you for stopping by. By the way, it always surprises me the eye you have to capture those amazing skies in your paintings. Thank you for sharing them with us. Interesting to know this new word for me. In P.R. it is not used, at least I have not heard it. I was just reading an article published by the Spanish newspaper ABC, on 11 November 2014. The génesis of the word marimorena and expressions such as se armó la marimorena has awoken the curiosity of some researchers into idioms in the past. The article refers to the Revista de Folcklore, from the Fundación Joaquín Díaz, which states that it was common for barmaids in the sixteenth century to be called María; and for Morena to be a way of referring to Spanish women. They sampled some literature where barmaid characters were so named. So, if this is the case it would be endorsing further what I have stated in the article. Unfortunately, I do not have time or resources to explore this further. The discussion of this was triggered in a class when listening to what Poet Francisca Aguirre says regarding her first time at a performance of Miguel de Molina, which she describes as … y aquello fue la marimorena (It was a scandal). Please click here to access to the documentary La España de la copla, 1908. It begins at 19.42. Thanks so much for explaining the origin of this word to me; and thanks for the link! Please note that there are two more links in my reply ( I should have made them more evident 😉 One to re-direct you to the newspaper article and the other to the Revista de Folcklore. Me encantó este articulo. Es siempre interesante explorar la historia cultural de palabras. Debemos reclamar la palabra y hacerla nuestra – como la palabra “gay.” Soy marimorena! Dear Jane, thank you for your kind comments. Languages evolve constantly and we,I believe, can be an active part into that process of transformation for a gender free unbiased language. Mi querido Adrian, esta historia, como tantas otras que deben existir, nos demuestran que hay en el lenguaje un alto contenido sexísta y por lo tanto utilizado como transmisor ideológico. Es tarea de todas las mujeres y todos los hombres no usar un vocabulario o expresiones sexistas o bien transformarlas en expresiones positivas. Se me ocurre por ejemplo el término machona: “niña, muchacha o jovencita afecta a participar en juegos de varones”; “mujer de accionar y aspecto masculino” considerado para una gran mayoría como algo indispensable a evitar o modificar. Yo diría,¡¡¡ repliquemos a Mari Morena!!!. Un abrazo. Estoy totalmente de acuerdo. El uso de ciertos vocablos y expresiones contribuyen a perpetuar la discriminación de género. Hay mucho trabajo por hacer y es tarea de todos y todas contribuir para que esto cambios se produzcan tan pronto como sea posible. Tus comentarios son muy bienvenidos. Un gran abrazo. A woman who stands up for herself. A tough woman who stood her ground. Though it was to protect the elites, and the soldiers probably had a point, she did her job well. I had never heard the expression. The highlight on this is that the meaning had changed. This expression has evolved: from a woman who stood up for herself to a quarrelsome woman or just “trouble”. Does this expression perpetuate the stereotypical view of women as being troublesome? I am inclined to think so. Do we face a challenge before these sort of language issues? I would say yes. Thank you for visiting the blog and for commenting. I know. But I was taken by her strength, especially since I’d never heard of her before. Remarkable though, how language changes over the centuries and now faster these days. ¡Adrián! No tenía ni idea acerca de la historia detrás de la palabra y menos aún, que la expresión derivó de un nombre propio. ¿ves? ¿Ves por qué DEBO leerte? Muchas gracias querida Vero. Es un placer grande saber que esto es util. Leer tu blog es siempre un gran descubrimiento también.